This entry was posted in Accountability, Depression and tagged Croatia, former Yugoslavia, peace activism. Bookmark the permalink. Joel is the founder of DBSA South Orange County. He received a degree in Anthropology from Pomona College, one of Forbes Magazine's ten top undergraduate schools. His manic adventures include traveling to former Yugoslavia during the 1992 war, believing he was the Creator of a messed up Universe, road rages, and running up $40,000 in credit card bills. 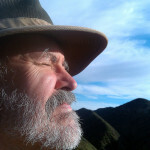 He lives with his wife, dog, and cat in Trabuco Canyon, California.